Choose well ripened figs and cool them in the refrigerator. Peel the skin and cut them into bit size pieces. Lightly rub salt on the sashimi, and put the sashimi on top of the the ripe pieces of fig on the plate you will server the food on. Sprinkle only a little balsamic vinegar on top. 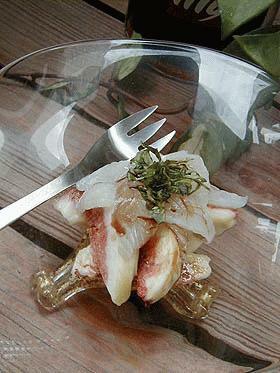 Serve with a cold wine or sparkling wine.